June 15, 1998, Lin and I and our children, Caitlin and Davis, left for London on a two month holiday to celebrate our 20th wedding anniversary. In London, we purchased a VW camper (with a guaranteed buy-back plan) and dubbed it “Happy” (get it?). Caitlin hated the color of the bus, which was hard to see in the cloud of smoke it was wreathed in. Davis disconnected Happy’s heater and that fixed the exhaust fume problem, just as our dealer predicted. It did not do much for warmth, however. We spent about a week in southern England and another week in Wales on a Canal Boat trip. Then we were in Ireland for a week (where we renewed our wedding vows in Tralee). Then we ferried back to England and headed for Scotland through the border town of Anan, then to Edinburgh and then Dunbar (the birthplace of John Muir) for a few days. That was the end of our vacation with our kids so Happy took us back to London and we put our kids on a plane home (that was planned!). We returned to Scotland through Glasgow this time, heading in to “Midge” (mosquito) country and experienced very few Midges. Oban was our destination because we wanted to research small Highland Cattle, the breed we raise. We wanted to backup our beliefs that these cattle were originally small and boy did we find information. In a small town close to Dunbar we had already purchased a very nice 1816 agricultural book that had a description of the breed and a reference to a “diminutive breed of Highland Cattle on the Isle of Skye”. Oban is where the Highland Cattle Society has a large Annual Highland Cattle Society Show and Sale (but not while we were there). For a small town, Oban had it all, but we headed for Skye. Driving to Skye is like driving through your dreams of meadow, pasture and mountains surrounded by diverse seascape. The librarian in Portree, on Skye, gave us the phone number of a gentleman who had been President of the local Highland Cattle Society. We called David Bryant and asked if we could come out. He directed us to the end of the road on a north west peninsula and then on to Ardmore Point, a beautiful, private, small peninsula of 180 acres and sheer cliffs that drop to the sea. This is their land/Fold and the buildings are 150+ years old. They had been 15 years restoring it with absolutely loving care. Janette’s solarium looks out onto her garden that is a masterpiece in this very rugged climate. 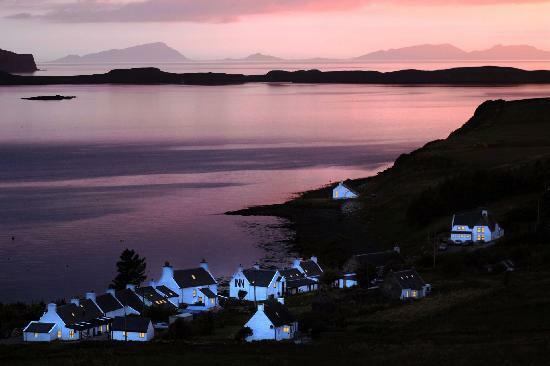 Living here is not an obsession, but a life style that is really stewardship, in keeping with the surroundings, in a uniquely situated place in the Skye. David and Janette have about 80 head of sheep and 30 or so Highland Cattle. We had such an interesting time that we forgot to look at David’s cattle. The history of such events as the Campbell/McLeod massacre that left 40 or so dead and buried, on their fold, in a mass grave on the lowlands of Ardmore Point, just a few hundred years ago, was much more interesting at the time. Then we took off for the mainland so we could go north and depart for the Outer Hebrides, form Fort William. 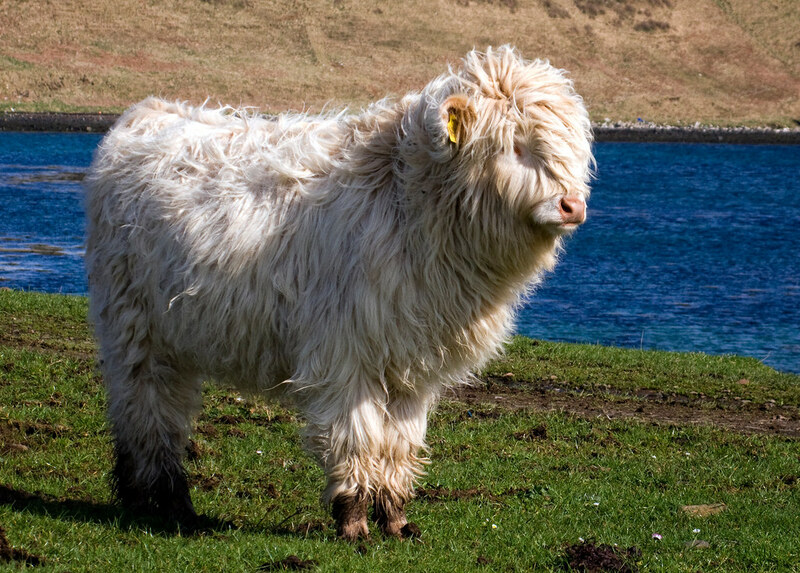 David knew a woman, on North Uist, that kept smaller Highland Cattle. We took back roads to a small ferry that was at one time the Drovers ferry and the first step in the long cattle drives to the south around London. These Drives began in the late 1700’s and dwarfed those of the American West almost 100 years later. We took the ferry to the northern most island of the Outer Hebrides, the Isle of Lewis, found a campground in the middle of the night and headed south the next morning. These islands are easily described as barren but that can be used to describe their own special beauty, like that of the desert. The residents are often involved in “Crofting” which means persons who work a combination of the farm, the sea and other endeavors – certainly not just one endeavor or they could not work year round. The next morning Happy took us around the Isle of Harris, but we felt like heathens. Everyone on this part of the Island was indoors, except to drive to worship. We went to a little bluff over a windy, sandy beach and had a very quiet and pleasant Sunday. 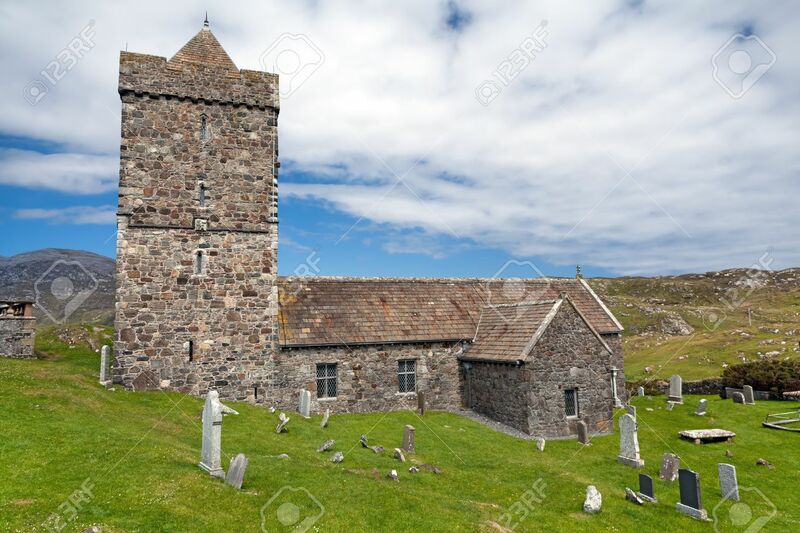 Monday, we went to the 15th century church of St. Clements, very close to the spot where the Campbells pushed off to raid the McLeods and then rest forever on Ardmore Point. After that we drove aboard a very unique and modern small ferry for the last stretch to North Uist. Una McNeil of Ard Bhan Fold and her son Angus are certainly Crofters and successful ones at that. She is involved in her community and manages over 80 head of Highland Cattle and is very well regarded by Highland Breeders throughout the UK. We were feeling very lucky to come upon people with similar interests yet who live a very successful life that is so different from ours. We were just getting ready to leave when Angus and his 5 year old son Frazier came back from harvesting peat that they use for heating and cooking. They were bachelors for a time because Angus’ wife, Michelle, was in Edinburgh. Ironically, we had met Michelle’s mother shortly after we had left Oban. In fact her mother had invited us back to the Oban area to help show Highlands a few weeks in the future. Small world, right! Angus asked us to stay for dinner and proceeded to prepare a gourmet meal. His Crofting activities include a successful Cockle clam business. This is not a simple pastime, but a business using his large farm tractors to pull a custom made clam harvester across the beaches of the islands. Angus continued Rick’s education with whiskeys from Scotland. Life on these islands 200 years ago or even 100 years ago was very difficult. There was no wealth or safety net for the common man and they lived by their wits and stamina. It produced a tough, hard working people that get along just fine now. We slept on their beach in Happy. 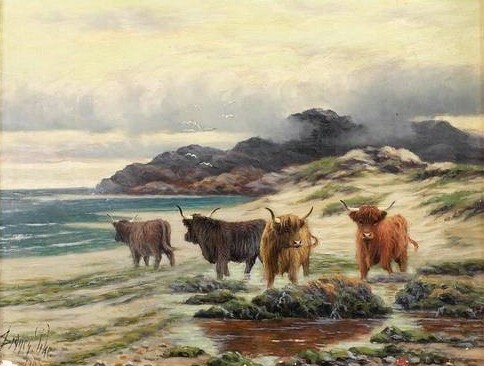 The next morning we awoke to Highland Cattle grazing on sea grass and kelp in the lapping waters of the North Atlantic. It is no wonder that these animals are so tough. Young Frazier went zooming by on the sand on his bicycle early in the morning and we could not but envision him as a man, acclimated to his environment, hardy, clever and full of fun. Our last Outer Islands stop was the Isle of Bara, likely our most magical stay on another beach. We left Barra and took a ferry back into Oban. We found another good campground and then spent time in book and antiques shops. We also toured the Oban Distillery. Lin found a lovely, delicate brooch, made in Chester, England in 1897 – an antique to us! We also purchased a gold Highland Cow charm that Lin uses as a necklace. Oban was a very nice town. The next day we went back to the Fold of Mrs. Janet M. Montgomery, Cnoc Lodge, Creagan, Appin. We had stopped by here earlier on a tip from a shopkeeper about Highland Cattle. At the time, we were in a hurry to get to Skye and when Mrs. Montgomery invited us back to help show on August 1st, we said we would be delighted. And we were. When we returned, the Cnoc Fold Herdswoman, Pat, and another handler, Bob, were washing cows. Well, we had done that before and were right at home. We learned some show grooming tips from these two. If you don’t show cattle, it is hard to appreciate how beautifully these animals were done, but believe me, Bob was a master at horns (he used a piece of broken glass to scrape them smooth, and then a bit of sand paper and then oil). It turned out that Pat also had a gold Highland Cow charm, so she and Lin became the “Girls of the Golden Cow”. Washing cattle boils things down to a common denominator, quickly. In short, we had a real yuk it up time and were really anxious for Conc fold to do well at the show the next day. When we got to the show Pat focused on all details and Bob grew, temporarily, quite serious, especially in the ring. Pat shows Janet’s herd at 10 to 12 shows each year (not a light load), including The Royal Highland and Great Yorkshire shows. They must be professional. Cnoc Fold prevailed and with a tack box full of ribbons we proceeded to celebrate the Lorn Agricultural Society Annual Show and its 150th Anniversary. This little fair was really very sweet, with a Bonny Baby contest, a hay bale toss, an anybody’s welcome dog show, pony jumping, Highland Dancing and everything a regional fair should be: thoroughly charming and celebrated with great ceremony and mirth. Bob really mirthed it up. We went back to the Montgomery’s for an outdoor meal overlooking Loch Cretan and laughed and hooted well into the night. “Monty”, Janet’s husband, had the most extensive, private, collection of whiskeys yet, of which we only sampled 11. If the sign of great whiskey is minimal effect the next day, these were of stellar quality. All this made for a very lively, warm, fun, wonderful evening that was absolutely first rate. Their daughter, Michelle, was back from Edinburgh and staying for a visit with her parents. With her were her two daughters. Michelle gave us great insight, on not only national issues, but outer island and agricultural issues. 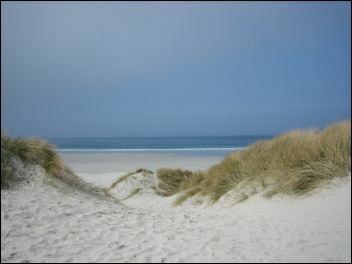 Having met the male side of the family, represented by Angus and Frazier on North Uist, we frankly expected someone different and could not help now to think that North Uist was in very good and intelligent hands for a few more generations. We learned a few things but nothing earth shattering. More than learning, we gained understanding. We know we don’t need much, so all that we have, light and heavy, is what we elect to have. Most of the really memorable things that came our way were facilitated by the hospitality of people, most of them strangers. People of various means who allowed us into their lives, often with no notice. Some would complement us on our adventuresome spirit, but who really took the greater risk? (Lin can be quite dangerous). We would like to wander more, to the end of understanding how others view life, giving us a glimpse through another window. That doesn’t seem very productive, but we loved it. A few years ago we purchased a framed print at a flea market. It turned out to be Sister Therese of Lisieux and when we read about her in our encyclopedia, we decided she should be the Patron Saint of our Blue Dawn Farm. She died in 1897 at the age of 24, but her simple writings were so profound that ultimately millions came to know her. While visiting our friend Fr. Sugrue, in Ireland, we noticed a small book about her which he loaned to us. In it, it was said that when she was asked “What is the ‘little way’ that you would teach?” Therese answered: “It is the way of spiritual childhood, the way of trust and absolute self surrender”. The trusting friendship we received, and hopefully gave, made our travels a joy. We hope this gives you a glimpse through our window. Highland Cattle have given us so much over the 20+ years we have had them. So many new friendships and wonderful days and evenings in the pasture when it was simply spiritual. These great animals have given us great humor, slight occasional sadness and strength from their example of bond, acceptance, Motherhood and adventure. I don’t know where those examples would have come from, otherwise. If you enjoyed “The Sanders’ Excellent Highland Cattle Adventure” enough that you want another 12 pages about our trip, other than just the cattle parts, email me at rsanders@integritydm.com. Rick Sanders has had Miniature Highland Cattle since 1992. He and his wife owned Blue Dawn Farm in Portland, Oregon. In 2003 they moved their cattle to their new Trembath Mountain Ranch in Fiddletown, California. Rick founded the International Miniature Highland Cattle Association, Inc. (IMHCA) and can be reached at P.O. Box 22, Fiddletown, CA 95629, 209-245-4900 or rsanders@integritydm.com . What is it Like to be Around Mini Highland Cattle?